Last month I did something that I have only done once before: I went on a trip to Paris without my husband and children. GASP! I know, right?! Who am I to be so bold and brazen, to travel across land and sea for several hours without them? I tell you who – a very happy woman. Don’t get me wrong – I love traveling with my kids, showing them the world and having adventures together. But as any mother knows, a vacation with your family is not really a vacation in the truest sense. And while I love traveling with my husband, he doesn’t like to shop for shoes and he probably thinks that I talk too much. A girlfriend trip was what I needed and what better place than Paris! I had been to Paris recently, once with my family and once with my husband, but I knew this trip with my friends would be different. As we planned the trip via email, texts and a few face-to-face meetings, we were all excited, but also nervous. Let’s be real: five women traveling together leaves a lot of room for drama and attitudes. We were a varied bunch: married stay at home moms, professionals, singles and single moms. Shenia, Christin, Natasha, Latoicha and me. There would be five different personalities and five different expectations about how the trip should flow. Since I had the most experience in Paris, I became the default planner. I worried: Would the women like the apartment that I had chosen? Would they love Paris as much as I do? Would we all get along? My worries were for naught. 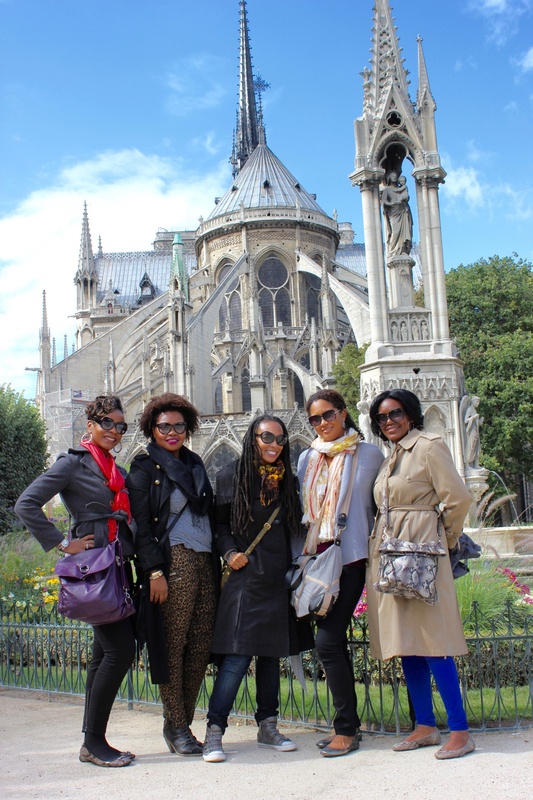 Everyone loved everything about Paris and we all had the time of our lives. The whole trip, as my friend Shenia said, was divine. Our divine blessing began with an uneventful flight and a cutie-pie driver who was familiar with Atlanta. He liked us and pitied us when we said that we had to haul all this luggage up 4 flights of stairs. Instead of dropping us off at the curb, he was going to help us. We knew that the elevator was being repaired when we rented the apartment, in fact we got a small price break for the inconvenience. But thank God that the elevator had just been fixed! It was tiny and we could only ascend one at a time, but it worked. It was indeed divine. And the apartment? – Haven in Paris hasn’t let me down yet; they are three for three with me. The apartment in the 8th was drop-dead gorgeous. And huge. It was absolutely perfect for us. After grocery shopping at the neighborhood store and taking a short nap, we walked to the Champs-Élysées for a bit of site-seeing. Christin saw the Arc de Triomphe and declared that we shall go to the top. There was an elevator, followed by a short flight of stairs, so why not? I tell you why not: because we never found that elevator, that’s why not. Instead we started climbing a winding staircase, thinking that it led to an elevator…..an elevator that never came. We climbed and climbed and climbed. Everyone complained. Except me. I was silent because I was trying to figure out how long it would be before I passed out or freaked out from being claustrophobic in that tiny, airless stairway. I was trying to focus. It would have been a shame if the group lost me so early in the trip – they didn’t even know how to speak French! Latoicha gave up and said that she couldn’t climb anymore (she had on heels). But I finally saw the end of the winding staircase and knew that I could make up and so could she. I called down to her to keep going and I breathed easier knowing that I could see the end. We all made it. Breathless and cursing, we made it. And you know what? It was worth it because we saw Paris as far as we could see and beyond. It was just the thing my friends needed to see to start our week and worth the climb. I ran back down the stairs and Latoicha took off those heels. The next day we took in many Parisian sights: Notre Dame, strolling along the Seine and Île Saint-Louis (and stopping at Berthillon for ice cream of course!) and relaxing in Jardin du Luxembourg. As we did every night in Paris, we had a great meal in a cafe or restaurant, drank wine and talked for hours. One day we went to Versailles. Versailles. Yes, that place again. Remember my Versailles video rant? Honestly I was not trying to see Versailles again so soon. I almost break out into hives just thinking about Versailles. But everyone wanted to go, so I went (see #6 below). And it ended up being a lovely day, although it didn’t begin that way. We got started later than we had planned (see #3 below) and then got lost on the train. For about 90 minutes we boarded and re-boarded the train. Different trains, the same train. Going this way, going that way. There’s Latoicha on one of the many platforms we stood on that day, while the rest of us look at the map to try and figure out just how the hell we get to Versailles. That photo also shows the umbrella that Latoicha carried all day long. That umbrella would become the bane of our existence as she had to check, retrieve and re-check it with security each time we entered a new building at Versailles. By the end of the day, we all hated that umbrella. We finally got on the right train headed to Versailles, thanks to a family from New York that we met at one of our lost train stations. Let me just point out that despite failing at navigating a fairly simple trip to Versailles, a 30 minute ride that turned into 2 hours, we were all in good spirits. No one was upset or irritated or breaking down. This is a major difference between traveling with these women and my family. If this had been my family, that lost 90 minutes would not have been pretty. Remember that missed Eurostar train to Paris? Right. So, we were headed to Versailles, but according to the NYC family we would have to switch trains. We followed them off the train. What happened next happened so fast. There was a crush of people to get off the train, but yet the train wasn’t crowded. I didn’t think anything of it, but the NYC mom did. As we were all standing on the platform, she quickly checked her daughter’s backpack and noticed that the cell phone was missing. She looked back on the train, through the open doors, saw a gang of teen girls and figured that they had stolen the phone. That would explain the crush of people while we were all exiting – except these teenagers never got off the train. The mother surmised that they had purposely crowded all of us so that one could steal the phone, while she passed it to another. Then the mother – this tiny unassuming women – demanded that the teenagers return the phone! I think the teenagers were as shocked as we were because they gave it back! From that point on, we referred to the NYC mom as Mama Bear because she was fearless and fearsome. We made it to Versailles without further incident and had a great (if exhausting) day. Our last day in Paris couldn’t have been lovelier. It was 72 degrees and not a cloud in the sky, one of those days that judging by the number of people sunning themselves along the Seine, Parisians live for. We started our day at the Vanves Flea Market, went to Musée Rodin, took a boat ride down the Seine, walked around the lively Marais neighborhood and ended our day at Tour Eiffel. I was too busy at the flea market to take many photos, but I got some very cool jewelry there. If I lived in Paris, I would go every Sunday, followed by a trip to Musée Rodin garden. It was so lovely and peaceful in that garden, it is now one of my favorite places in Paris. Weeks later we still text each other about our favorite paris moments and we’ve had lunch a few times; conversation inevitably turns to Paris. It was really a special trip and I know none of us will ever forget it. There was no drama and no divas. I was never annoyed (and I’m easily annoyed). Everyone was easy-going and happy all week long. We talked non-stop, laughed until we lost our voices and had a blast. And why not? We were in Paris! 1. Select one person to handle all the logistics. That was me. While it was a lot of work, it was best to have one person know all the pertinent information about where we needed to be and when. 2. Make sure everyone has a say in the itinerary. We had a meeting and I wrote down everyone’s “must see and do” in Paris. Then I made a loose itinerary based on those wants and also a few places that I knew they just had to experience while in Paris. I really tried to make sure that everyone got to do at least one or two things that were important to them, but also wanted to leave time in our day for the unexpected surprises that are such a magical part of being in Paris. 3. Be flexible. Sometimes our day didn’t go as planned. Most of the time we didn’t get out the apartment as early as we had planned the night before (five women getting ready at the same time, go figure). We just regrouped and reconfigured our day. 4. Find a great place to stay. Our apartment was perfect because not only was it beautiful, it was very spacious. There was enough room for our stuff (and we had so much!) and for us to lounge around. We were never on top of each other and since the bedrooms were in the back, if a few wanted to stay up late while a few wanted to go to sleep, it was not a problem. We almost chose a smaller place with just one bathroom and that would have been a mistake. 5. It’s okay if you don’t do everything together. We only had one instance when we split up; two of us were tired and chose to stay in to watch a movie and the other three went out to party. That was okay; we all had a good time. 6. Sometimes, take one for the team. That was versailles for me. I knew that my friends really wanted to go and probably would have not gone if I stayed back in Paris, so I sucked it up and spent another day in Versailles. Latoicha said to me later about Versailles, “Wow, you must really love us to go back to Versailles.” – she realized only afterwards what a sacrifice that truly was. But despite the exhaustion of Versailles, I still had a good time just being with my friends and they had a great day. It was worth it, just to see them happy. 7. But it’s also okay to say “no.” Natasha and I put our foot down about visiting Musée du Louvre. We had been before and did not want to spend another day – our last day – in the crowds and giant halls of one of the world’s biggest museums. But we encouraged the others to go and we would meet up with them later. They chose not to go, we all went to Museée Rodin instead, but it was their choice to abandon the Louvre. 8. Sometimes someone just has to make a decision. On our next-to-last day, Saturday, it was almost time for the stores to close. We were at at crossroads: we could go to the Marais to shop at vintage stores, or we could go to one of the big department stores, we didn’t have time for both. Latoicha really wanted to go vintage shopping and felt that her trip to Paris wouldn’t be complete with that experience. Natasha wanted to go shoe-shopping at the department store. Latoicha was having a little tantrum about it (admit it Latoicha, it was a tantrum! ), so Natasha gave in, she would not go shoe-shopping. However, I knew that while the department stores were not open on Sundays, the shops in the Marais were open. I said to Latoicha, “We are not going to the Marais today, but I promise that I will take you there tomorrow.” She let it go (grudgingly), and we made it to the department store in just enough time to buy Natasha’s shoes. The next day, true to my promise, we went the the Marais and Latoicha hit the vintage shopping jackpot – an Hermés scarf. 9. Help each other. Christin got tired of carrying her big camera everywhere, but it was the best camera in the bunch, so many times Shenia carried Christin’s camera instead. I mapped out all of our day treks, but when I spent too much time pouring over the map, Natasha stepped in and helped me navigate. And we all took photos of each other. 10. Chill. Seriously, nothing is that important. Have fun! You’re on vacation! P.S. You may also like these posts about Paris. Planning first time trip to Paris with spouse and getting overwhelmed with hotel opinions. Any recommendations on hotel and tours. Hi Angie, I’ve never stayed in a hotel in Paris – only in an apartment that I have rented through Haven In or VRBO. I’m sure there are airbnb rentals as well. So that I can’t help with hotels. As for tours, I’ve never taken a tour, opting instead to create my own. If you search “Paris” on my website, there are several posts with things to do. I hope this helps and you have a wonderful time in Paris – my favorite place in the world! Thank you! I will give you an update after I return. Please do; I love to hear about trips to Paris! 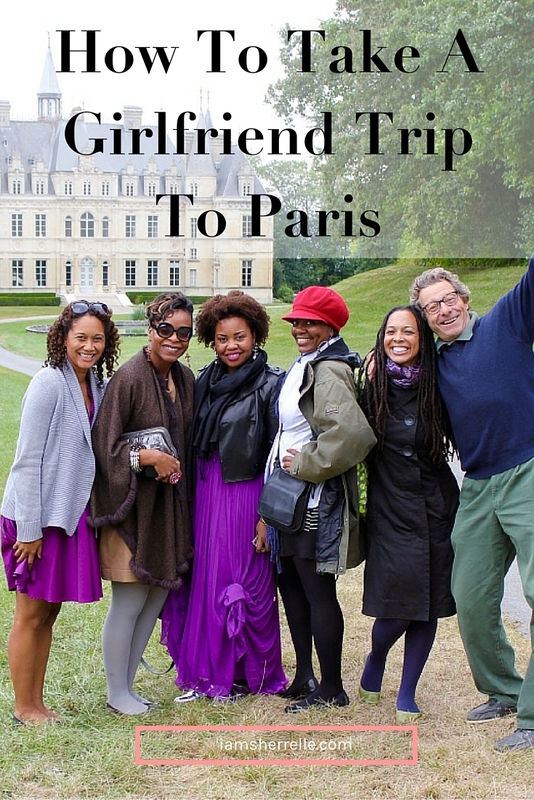 I just found your blog as I’m currently planning a girls’ trip to Paris! How many days were you there? My friend wants to stay a week but I’m just not sure I can stay that long. Hi Carlene! We were there 7 days, so traveling a total of 9 days (allowing a day there and a day back for traveling). I really feel that you need 7 days in the city, so if you can pull it off, that would be ideal – especially if it’s your first time there. Jet lag is real. If you can time your travel to land mid-day, have an easy day of touring the rest of that day and stay up until 9:00pm (that’s my rule for curbing jet-lag), then you should be okay to go the next day without being too tired. But if you can’t go that long, go anyway! I have another blog post How To See Paris In 4 Days that might help if you are traveling for less time. In fact, just type in “Paris” in the search bar and there are several posts that will help you plan a vacation based on the time that you have. My girlfriends and I went on a champagne tour one full day and then took a trip to Versailles another full day, so if you eliminate those 2 days, we were in the city of Paris 5 days. I hope this information helps and I wish you a great vacation! I need to plan another trip myself! Great recap (and the longest post I think I’ve ever read…LOL)! Thanks for being a part of the Traveling Brown Girls Blog Carnival. *Cheers* to Paris! Now you know this is my dream place to visit, let me know next time you are planning a trip! I am crying over here. Priceless. Yes I did have a tantrum. Hilarious. I just love you. Thank you for Paris. Yes, you did have a tantrum LOL! But it was funny. The whole trip was perfect.